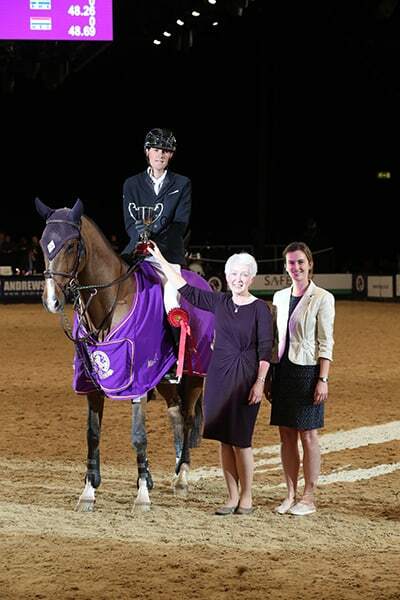 Frenchman Geoffroy De Coligny declared: “I love Birmingham!” after winning his second major class at Horse of the Year Show in the NEC Genting Arena. After landing the Accumulator class in thrilling fashion on Saturday, he added the Zinc Management Speed Horse of the Year title to his HOYS collection. But it could not have been much closer, with only 68 hundredths of a second separating the top three finishers. Geoffroy was drawn early, but he set a scorching pace in the one round class, clocking 44.27 seconds with Raimondo du Plessis, and that proved uncatchable despite the best efforts of runner-up Francois Mathy Jr on Falco van de Clehoeve, with Matthew Sampson and Doriena finishing third. But perhaps the real hard luck story belonged to Britain’s Guy Williams, who clocked the quickest time among 20 starters, but he had the last two fences down.